Evan Buitenhuis made 33 saves in net to keep the game close for Worcester as the Thunder had three different goal scorers and got 16 saves from Cam Johnson to pace for their sixth straight win. Adirondack skated out to a 1-0 first period after a faceoff win in the offensive zone and Blake Thompson sent a quick shot from the blue line that was deflected in front by Brian Ward (4th) through the pads of goaltender Evan Buitenhuis at 17:35. Barry Aleida hit the crossbar for the best chance for the Railers in a chippy first frame that saw each team throw nine shots on goal. 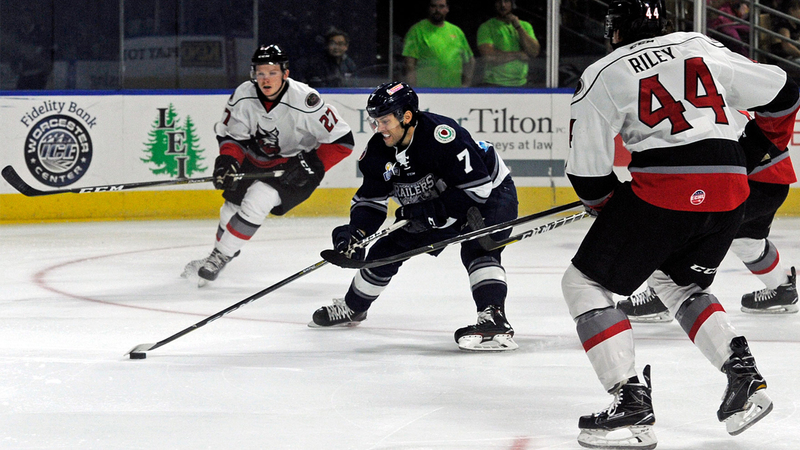 The Railers had three power plays in the second period but could only muster three shots during the 20-minute frame. Evan Buitenhuis made 11 more saves in the period to keep the Railers in the game trailing just 1-0 through 40 minutes of play. Mike Szmatula (4th) added an insurance goal after a loose puck trickled in front of the Worcester cage from behind the net at 10:10 of the third period. Conor Riley (5th) added an empty net goal at 19:15 to give Adirondack a 3-0 road victory. Notes: Three Stars: 3rd star: Evan Buitenhuis (33 saves) 2nd star: Cam Johnson (16 saves, Win) 1st star: Brian Ward (GWG)….Final shots were 36-16 in favor of Adirondack… Cam Johnson (2-0-0-0) made 16 saves on 16 shots for Adirondack….Evan Buitenhuis (1-1-0-0) made 33 saves on 35 shots for Worcester with Ryan Hubbard served as the emergency backup..….Worcester went 0-for-5 on the power play while Adirondack went 0-for-6…. Tommy Kelley (inj), Yanick Turcotte (inj), David Quenneville (inj), Tommy Tsicos and Connor Doherty did not dress for Worcester…. Jeff Kubiak and Mitch Gillam are currently on recall with the Bridgeport Sound Tigers… Ivan Kosorenkov made his professional debut for the Railers….. the Railers fall to 16-4-1 in their last 21 regular season home games at the DCU Center….defenseman Kyle McKenzie received a game misconduct after the Thunder made it 1-0 in the first period…..the Railers only had seven shots over the final 40 minutes of play. The Railers will host GUNS N HOSES NIGHT on Saturday, Nov 3 with a special appearance by Ray Bourque presented by Berkshire Bank! Tickets as low as $15! Doors open at 4pm for the Worcester Police vs Fire game followed by the Railers and Growlers at 7pm.